DOES: provides basic parts to build decorate outsides of simple wind-up robots. you can be really creative and kind of funny! I've never really been a kit buyer. I don't know why. Maybe it is because I don't like reading directions. With kits, it is recommended that you read the directions especially since the amount of material that comes in the box is finite. Thus if you screw up, then you can get really mad at yourself and the kids won't be so happy either. I don't like screwing up in front of my kids and so I like to read the directions in advance but my life gets ahead of me and sometimes you just have to go and open the box with them and just wing it together. My children don't wait for me to read directions, they hands move first and start working. I just have to go with the flow. We did it that way for Wind-Up Workshop Robots. Well sort of, I opened it once and figured out how much time it would take and how patient (I or they) would have to be and then I waited for the day. 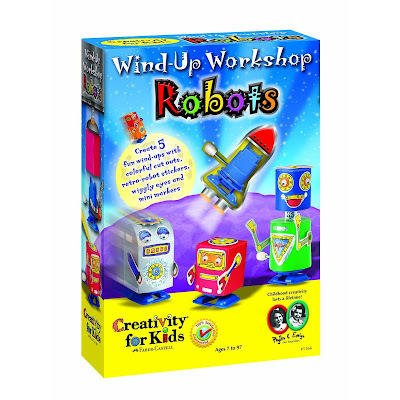 Finally, during the most recent Spring Break, Numbers 1, 2, and 3, and I sat and opened up the Wind-Up Workshop Robots kit by Creativity for Kids. A reader had suggested it to me. This is my first Creativity for Kids kit ever and possibly the 2nd or 3rd kit we've ever used. It was so much fun and I didn't really have to read the directions! Yeah! I suppose that a kit in itself is not really supposed to be open-ended. You are there to create a finished product and it should look something like the pictures on the box, right? And I think that is a good thing. What kits can do by not being so open-ended is teach! Don't get me wrong. Being open-ended and having fresh ideas is always the goal but just like a new brush stroke or a new dance move, I think teaching techniques can help children form their own ideas. It's up to the kit to make sure that their teaching leads to creativity as the end goal. Does this do that? The verdict: YES! 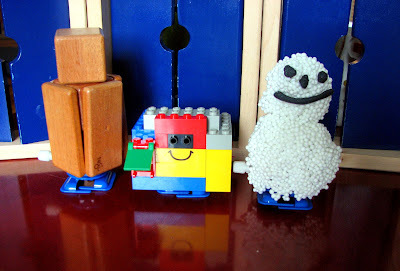 How Do You Know if a Kit Can Promote Creativity? What I liked about the kit was that you did NOT have to build the wind-up part of the wind-up robot. The robot was there, just a skeleton with no "skin" or "head" and so all you had to do was give it the outside body! After the kids use their designer talents, they just have to wind it up and it moves! Likewise on a more conceptual level, when there is good structure, there is less of a need for grown-up help. This is not just good because we grown-ups can get a break. This is also good because we really want kids to come up with different things and sometimes that means we should leave them alone. 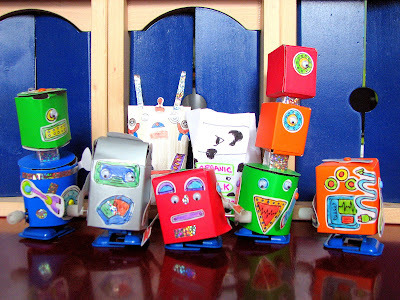 There were little arms and legs that could color and stickers you could color and stick on to the robot. You really didn't have to read the directions. Everything is a cut-out (arms are punch-out) and so if you wanted to, you can take the paper body frame and trace it onto blank card stock or index cards so that you can have "bodies" again, the next time you used it. It was fun to try to figure out how to make more robot bodies after we used all of the robot bodies that came in our kit. We tried to copy their structure but also ended up making our own. That is an awesome learning aspect because a child must access his memory and estimate how big his paper needs to be before cutting and creating a paper robot body to fix onto the plastic skeleton. Not easy on the first try but you can definitely get it done. We also used different materials that were not paper in origin. Thanks to playdough and aluminum foil, anything is possible. I wonder if the true sign of a good kit is to laugh at yourself when it doesn't work your way. Maybe it is. But I made a robot with my kids and I used the adhesive foam squares to secure the paper "body" onto the actual wind-up robot. I wound it up and realized that it started going backwards! My kids would not stop laughing. I wish we could all laugh from our mistakes like we did that day. After the Backwards Robot Incident, no one made a backwards robot by accident. It was either purposely going backwards or not. After using playdough, you sort of realize that you can make it become anything and then kids can see which one might move faster and test out the balance of their designs. I love when they can use their existing toys! This snowman glows in the dark! The package on the box says 7+ but Number 2 who is just five, loved making robots and if you think about it, many kids his age like wind-up anything. I myself can't stand wind-up noise but it is music to me if it was my kid who built something and felt successful.. Depending on how old they are you can prepare anything in advance, you can punch out in advance, you can color some of it for the in advance, etc... Even though the robots are small, there are opportunities for small hands for creating more embellishments. You can put different stickers on them too. You don't have to solely use the stickers that they give. And with the very small stickers, we literally used tweezers so that we could get it "just right." (Yeah finger muscle exercise!) The kids really liked using my eyebrow tweezers. Number 1 steals them from me all the time for his science "experiments." Still, the parts are small so for the little ones, I highly recommend using different more pliable materials like playdough or playfoam. It's just so easy and so funny. What I like about kits or most DIY toys is that it has function! In this case, they made a toy- that is the function. That is the purpose. As long as it moves and it doesn't fall apart in seconds, the mission is accomplished. Likewise, other kits that have a function/purpose such as jewelry or hair accessory is really great. Number 5 is testing out something in that realm so all you parents and teachers of girls, look out because she is going to make amazing things! All in all, whether it looks like it was made by a two-year old or looks like it was made by an artist, all functioning crafts serves as a visual reminder to the creators (the kids) that they made something and that it worked. Go baby engineers! Hey, let's do a math worksheet now! Hey, where ya going? Our robot family. The red one is the one that I made and that is the one that goes backwards. Of course that is the favorite because Mom screwed up. My favorites are the one-eyed robots. I think that is the final marker of a great kit- there is potential for more learning and creating via the knowledge foundation built and/or materials provided in the kit. Number 5's mom put it best when she said that she likes things that are not "too one-note." With Wind-Up Workshop Robots, kids will definitely have something to work with after they have completed the project. Not only do they have some of those sticky foam squares left to hold the paper body to the wind-up robot structure but the great thing is that there are paper bodies! What I mean is.... when they are done with it and have forgotten its existence, you can gently remove the paper bodies and re-use those plastic wind-up robot structures again! (OOOH, but please remove gently and line up the "1st generation" somewhere because they will scream in horror if it's ripped up and tossed in the garbage, even though they haven't touched it in months!). 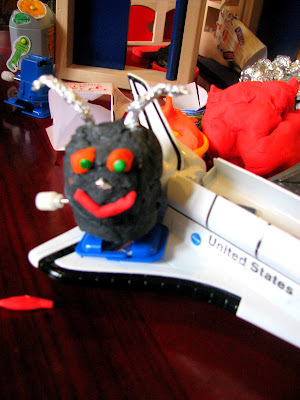 The first generation could also serve as a reminder as to what a good structured robot looks like but if your kids don't need them, have them experiment with different materials (playdough, moon dough, play foam, tin foil, wood??etc...). While this seems like such a simple project, if you are open to them being open or if they are open to you being more open then the benefits reaped are likely limitless. Happy Robot Building to All! May your robots walk backwards only on purpose! I don't know why but this 7-second video makes any kid laugh. Note: Toys are Tools has not been compensated in any fashion by the manufacturer or retailer of any of the mentioned products for the publication of this post. This product was happily purchased by me after a reader suggested it! Thanks to all readers for your suggestions! The winning prize is courtesy of Creativity for Kids. Thanks! I like how you can put other materials on it. Younger children like wind-up toys. Does it come with extra eyes? This is really cool. My boys are going to love this! The play-doh and lego ideas will just blow their minds. it looks like a hand made robot. Are we allow to decorate them? Very artistic too! Wish they can talk any simple sentences. The Playdoh robots look cool! My son is obsessed with robots. He was a robot for Halloween last year and made his own robot shoes. I bet he'd have a blast making everything we own into robots. We love robots too. We are more into the ones that walk or have wheels and remote controls but these look like a fun way to spend a rainy day. It's hard to do the lego but it is possible. To get it to stick on, I often used a little playdough. I think using playdough and playfoam was the easier to do. Good luck! My engineer husband would probably have a great time coming up with alternate ideas on this one with the kids! And then I'm sure one of them might want to take it apart to see how it works - then the true challenge is if it can be put back together! This looks like fun. It looks easy to do. Hope I win. Will use with my students. Okay, so when I first saw this pot, I lmost breezed by it becasue I am not a kit person and the product seemed to closed to me. Leave it to you to prove me wrong with a quick scan and to keep me reading (and marveling) more. I LOVE YOUR takes on what could otherwise be a rather bireif, yet fun exploration.